Niagara Falls, NY - You can't keep these fireflies in a jar, as the owners and friends of the 24 Below Gallery get into the spirit of things as they prepare for Dance of the Fireflies. The gallery is sponsoring a Firefly Parade on Saturday. Dance of the Fireflies is an exciting event that will celebrate Summer Nights each August. The celebration begins at 7pm at 24 Below Gallery, which is located at 24 Buffalo Avenue, the former Niagara Club. All ages will be invited to make glowing crafts such as firefly lanterns and to get their faces painted. Everyone of any age is encouraged to come dressed as a firefly, a fairy, or another glowing creature. At 8pm there will be a costume contest open to everyone! 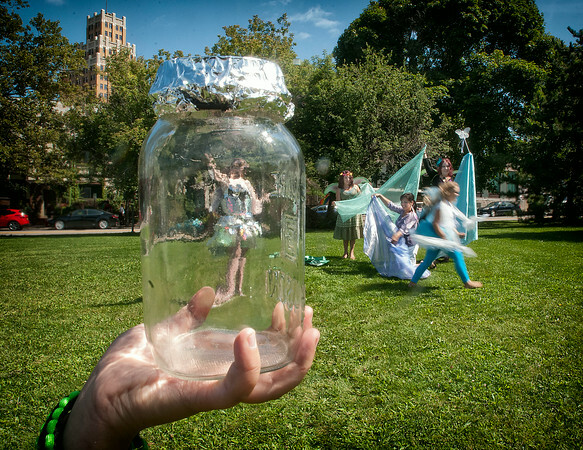 At 8:45 the Firefly Godmother arrives- and will enchant the crowd with fantastic storytelling. At 9pm, the Firefly Godmother will lead everyone on a Glowing Procession from Buffalo Avenue up First Street. The procession then turns onto Old Falls Street and will stop for a beautiful choreographed Firefly Dance.